The youth vote in the United States is a political term used to describe 18- to 24-year-olds and their voting habits. Many policy areas specifically affect the youth of the United States, such as education issues and the juvenile justice system  The general trend in voter turnout for American elections has been decreasing for all age groups, but “young people’s participation has taken the biggest nosedive”. This low youth turnout is part of the generational trend of voting activity. Young people have the lowest turnout, though as the individual ages, turnout increases to a peak at the age of 50 and then falls again. 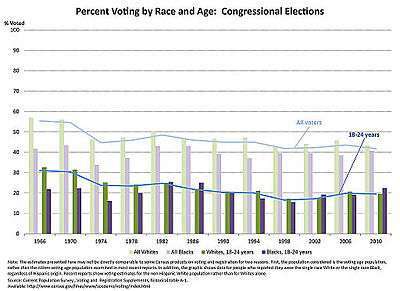 Ever since 18-year-olds were given the right to vote in 1972, youth have been under represented at the polls. In 1976, one of the first elections in which 18-year-olds were able to vote, 18-24 year-olds made up 18 percent of all eligible voters in America, but only 13 percent actually voted - an under-representation of one-third. In the next election in 1978, youth were under-represented by 50 percent. “Seven out of ten young people…did not vote in the 1996 presidential election… 20 percent below the general turnout”. In 1998, out of the 13 percent of eligible youth voters in America, only five percent voted. During the competitive presidential race of 2000, 36 percent of youth turned out to vote and in 2004, the “banner year in the history of youth voting,” 47 percent of the American youth voted. Recently, in the 2008 U.S. Presidential election, the number of youth voters tripled and even quadrupled in some states compared to the 2004 elections. The lack of youth participation in the voting process is not a random phenomenon. There are multiple variables that have an influence on the voting behaviors of youth in the United States. The voting process has two steps. An eligible voter - a U.S. citizen over the age of 18 - must first register to vote and then commit the act of voting. The voting process is regulated by each state individually and therefore varies from state to state. The process of registering to vote is different depending on the state. Pre-registration is available to youth under the age of 18 in 20 states and Washington D.C. Potential voters may also register on Election Day - or on the day on which they vote early - in 10 states and Washington D.C. This may be done at the polling place or at an election official's office. Residents of the 40 states which do not allow same day registration require potential voters to register by a deadline, typically from eight to 30 days out from the election. Over half of the states in the U.S. offer some sort or online voter registration. This consists of the same process as a paper registration form, only it is digital on the internet and send to election officials to review over the web. This process was first introduced in Arizona in 2002. There are different regulations on the time and avenue through which a citizen can vote. Early voting is available in 33 states and Washington D.C. This must be done in person at a designated polling place. Early voting period lengths vary from state to state. If a potential voter is not able to vote in person on Election Day or during the early voting period, they may request an absentee ballot. In 20 states, an excuse must be filed to receive the absentee ballot. In 27 states and Washington D.C., a voter may acquire an absentee ballot without an excuse. In Washington, Oregon and Colorado all voting is done through the mail. A ballot is mailed to the voters residence and after the voter fills it out, he/she may mail it back. No in person polls are conducted. Otherwise, the typical voting period is twelve hours on a weekday at which time voters must go to the polls in person and cast their votes. The winner-take-all system in the United States limits the success of third party candidates who may have a difficult time achieving an electoral majority. Young people are increasingly supporting third party candidates, though the American political system has continued to foster a two-party system. In 1992, Ross Perot, a third party candidate for president, won 22 percent of the eighteen-to-twenty-four-year-old vote, his strongest performance among any demographic group”. These third party candidates who gain such support from the youth of the U.S. do not benefit from major party coffers - they must campaign by themselves. In nine out of ten elections, the candidate who spends the most money is elected. The average cost of a successful campaign for the United States House of Representatives is nearly half a million dollars. A large portion of this money comes from "large individual contributions" – an average of 74 percent of the campaign funds raised in the 2012 presidential election between Barack Obama and Mitt Romney were large individual contributions. An average of 25 percent of presidential campaign funds in 2012 were made in "small individual contributions." The Supreme Court rulings on Citizens United v. Federal Election Commission in 2010 and SpeechNow.org v. Federal Election Commission allowed corporations and individuals to donate directly to political action committees (PACs), Super PACs, or 501(c)(4)s which could then spend unlimited amounts of money on campaigns of their own. The general perception of this system is that in turn for such large donations, candidates will vote in accordance to their large donors to ensure future donations during their reelection bid and pay the smaller donors slight attention. When the media reports that on campaign finance scandals, it is portrayed as a solitary incident with no connection to later policy outcomes. Americans have become so accustomed to the power of money in politics they are not surprised when a scandal occurs. The future for the influence of large donors is unlikely to change because the lawmakers with the power to create and pass campaign finance reform are those who benefit most from the large donations when their term is up and they must run reelection campaigns. Between the ages of 18 and 24, youth have the potential to graduate high school, move away to college and change residences multiple times as they begin their career. As youth change residences often, the local issues and elections relevant to the area may not affect the youth yet or be significant and change from residence to residence. College students face the decision whether to stay registered in their hometowns or to register in the community in which they will reside. The fewer federal tax obligations that apply to youth ages 18-24 only loosely tie them to the government and policy making decisions and do not entice youth to vote and make a change. Young people complain that those in politics do not communicate with them. Political candidates and their campaigns know, through past election data, that youth are not a reliable voting group and choose to spend their campaign dollars on those who are more likely to turn out to vote. For this reason, candidates tend to focus on issues that pertain to their targeted voters to gain their support, further discouraging youth voters. The discouraged youth complete the cycle of neglect by not turning out to vote, proving to candidates they the youth are not a reliable voting group. "Elected officials respond to the preferences of voters, not non-voters," rightfully ignoring the youth of America who do not turn out to vote. Though many consider voting a civic activity, youth today seem to have separated the political from the civic. Youth often participate in volunteer opportunities, fundraisers and other activist activities. In this way, youth can make a difference in their communities and are able to see change immediately when seeing the larger picture of a movement, including the political aspect, may be more difficult or intangible. A variety of organizations, including the Student Nonviolent Coordinating Committee, the Black Panthers, the Young Lords, and Youth Liberation of Ann Arbor each worked to encourage young people to vote together and for common issues. Young adults are “over-represented among all computer and Internet users” – three fourths of Americans under the age of 18 are able to access a computer and, on average, use it for half an hour a day. As the Internet and computers have become more accessible to youth, such methods have been used to seek and find information and share it on social media cites. Websites such as Facebook and YouTube not only allow youth who don't subscribe to newspapers or watch the evening news to stay on top of the polls, but also allows them to share their opinions of the polls and candidates. If the use of technology were to be fully integrated into politics, the youth and adult groups would be equally active in politics. In the United States, there has been legislation passed that helped youth access the vote. The National Voter Registration Act (NVRA), often called the “motor-voter” law, passed in 1993, allows those 18 years and older to register to vote at a driver's license office or public assistance agency. The law also required states to accept a uniform mail-in voter registration application. Additionally, some states have extended the period in which citizens can vote instead of requiring a vote within 12 hours on a single day. 1 2 3 4 5 6 7 8 Iyengar, Shanto; Jackman, Simon (November 2003). "Technology and Politics: Incentives for Youth Participation". International Conference on Civic Education Research: 1–20. ↑ Sherman, Robert (Spring 2004). "The Promise of Youth is in the Present". National Civic Review: 50–55. 1 2 3 4 5 6 7 8 9 10 11 12 13 14 15 16 17 18 Walker, Tobi (Spring 2006). ""Make Them Pay Attention to Us": Young Voters and the 2004 Election". National Civic Review. 95: 26–33. doi:10.1002/ncr.128. ↑ Klecka, William. "Applying Political Generations to the Study of Political Behavior: A Cohort Analysis". Public Opinion Quarterly. 35 (3): 369. doi:10.1086/267921. 1 2 3 4 5 6 7 8 9 10 11 12 13 14 15 16 17 18 Strama, Mark (Spring 1998). "Overcoming Cynicism: Youth Participation and Electoral Politics". National Civic Review. 87 (1): 71–77. doi:10.1002/ncr.87106. ↑ Harris, Chris. "Super Tuesday Youth Voter Turnout Triples, Quadruples in Some States." MTV News. retrieved 6 Feb 2008. ↑ "Register to Vote". USA.gov. U.S. Government. Retrieved 9 December 2014. 1 2 "Elections and Voting". The White House. Retrieved 9 December 2014. ↑ "Pre-registration for Young Voters". National Conference of State Legislatures. Retrieved 9 December 2014. 1 2 3 "Same Day Voter Registration". National Conference of State Legislatures. Retrieved 9 December 2014. 1 2 "Online Voter Registration". National Conference of State Legislatures. Retrieved 9 December 2014. 1 2 3 "Absentee and Early Voting". The National Conference of State Legislatures. Retrieved 9 December 2014. ↑ "Source of Funds". OpenSecrets.org. Center for Responsive Politics. Retrieved 9 December 2014. ↑ Coates, John (November 6, 2012). "Corporate Politics, Governance, and Value Before and After Citizens United". Empirical Legal Studies. 9 (4): 657–696. doi:10.1111/j.1740-1461.2012.01265.x.